The origin of this name is said to be Caimeul from cam Gaelic (wry) and beul (mouth); wry-mouth. The origin of the clan is traditionally placed among the ancient Britons of Strathclyde, but the first Campbell in written records is Gillespie in 1263. Sir Neil, Cailean's son, allied and escorted Robert the Bruce who rewarded him with land forfeited by the Lords of Lorn. He married the King's sister from which was born John, later created the Earl of Atholl. John was killed in 1333 at the Battle of Halidon Hill but with no issue to the thrown the title of the lands passed from the Campbell's hands. Sir Colin's son, Sir Duncan Campbell of Loch Awe, took his place in 1413 becoming Lord Campbell in 1445. He was superseded by his son Archibald Roy in 1453 whose son, Colin, was created Earl of Argyll in 1457. Colin's son, Archibald, 2nd Earl of Argyll, fell at Flodden having been a Lord High Chancellor. Archibald, 5th Earl of Argyll, died without issue in 1575 fighting for Queen Mary at the Battle of Langside passing the title to his brother Colin. Archibald, 7th Earl of Argyll, commanded the army which was defeated by the Earls of Huntly and Erroll in 1594 and reduced the Macgregors in 1603. In 1607 Archibald was granted the former Macdonald lands in Kintyre Archibald, 3rd Duke of Argyll, although a proponent of the Treaty of Union,1707, died without issue in 1761. His cousin, General John Campbell of Mamore, thus took up the succession. George's eldest son, John George Edward Henry Douglas Sutherland, (b. 1845) married Princess Louise Queen Victoria's daughter in 1871. Presently, Clan Campbell is a global association based at Invarary Castle which is also the 12th Duke of Argyll and 26th chief's home. The Campbells of Breadalbane trace their family history back to the 1st Lord Campbell, Sir Colin, Sir Duncan Campbell's second son. Through his wife, Lady Marjory Stewart, he obtained a third part of the Lands of Lorn accounting for their patronymic of the House of Breadalbane - MacChailein - Mhic - Dhonnachaidh (son of Colin, son of Duncan). Receiving Glenlochy from his father in 1432, Sir Colin built Kichurn castle in 1440 and in recognition of his honour in Palestine was created a Knight of Rhodes. Sir Colin?s descendants added to the family land including Glenlyon, Finlarig and territory throughout Argyll and Perthshire. Born in 1635, Sir John Campbell, 11th of Glenorchy, supported King Charles II. He was created the Earl of Caithness in 1677 having bought most of his estates. Sinclair of Keiss, establishing his right to the Caithness Earldom, Glenorchy was created Earl of Breadalbane in 1681. In 1689 he was paid to bribe the Highland clans to comply with King William III. He died in 1716. In 1896, John, 14th of Breadalbane, was created a UK baron to become the Marquess of Breadalbane. John, 4th Earl, succeeded as the lineal descendant of Colin of Morchastar, Sir Robert the 3rd Baronet's second son. His son John, 2nd Marquess and 5th Earl succeeded him in 1862. Dying without issue, the Marquisate of Breadalbane and Earldom of Ormelie became extinct. 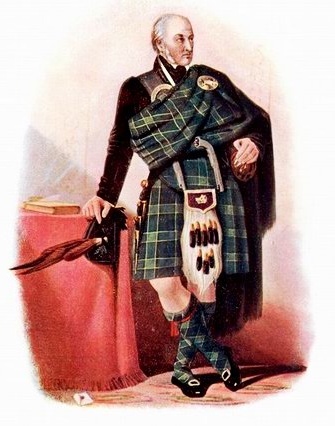 The Scots titles were succeeded by Sir John Alexander Gavin Campbell, 6th Earl of Breadalbane. His son, Gavin, 7th Earl, was created Marquis of Breadalbane in 1855 but also died without issue in 1922. The Marquisat became extinct and the Scottish honours devolved on his nephew, Iain Edward Herbert Campbell, 8th Earl who died in 1923. Today Taymouth Castle, the principal seat of the House of Breadalbane, is a hotel but the Earl still holds large estates. There are many cadets of the house notably Campbell of Glenlyon, and the baronets of Bercaldine.